Bringing great wireless connectivity to a new stadium is almost table stakes these days. 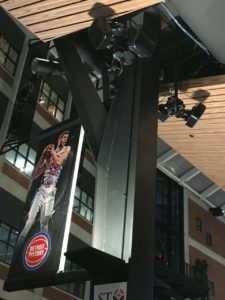 But building up a nearby commercial district — and keeping connectivity high outside the venue’s walls — is a bet of another level, especially in Detroit where networks extend outside the new Little Caesars Arena into the 50-block District Detroit. 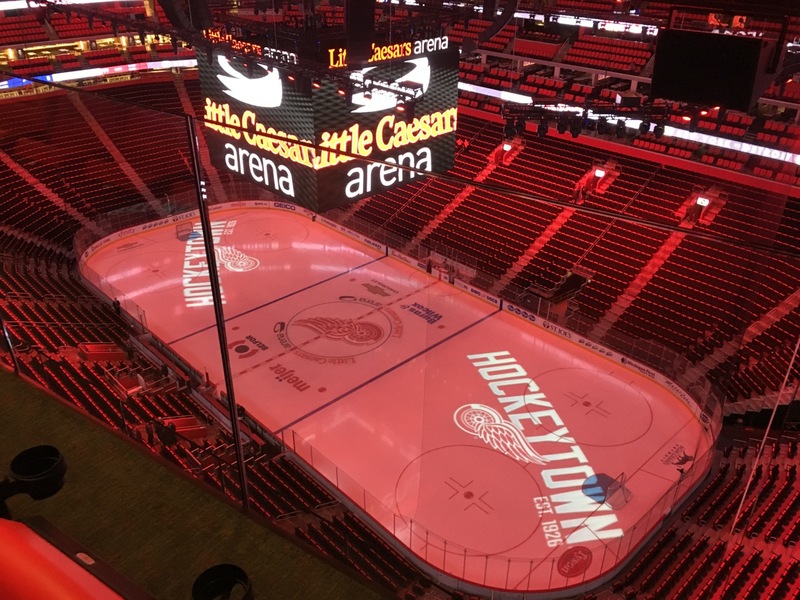 Following the arena’s opening in September of 2017, the prognosis so far is so far, so good, with solid reports of high network performance on both Wi-Fi and cellular networks in and around the new home of the NHL’s Detroit Red Wings and the NBA’s Detroit Pistons. 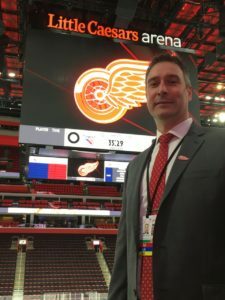 But for John King, vice president of IT and innovation for venue owners Olympia Entertainment, the responsibilities for him and his network team extend far beyond the new stadium’s walls. Editor’s note: This profile is from our most recent STADIUM TECH REPORT for Winter 2018, which is available for FREE DOWNLOAD from our site. 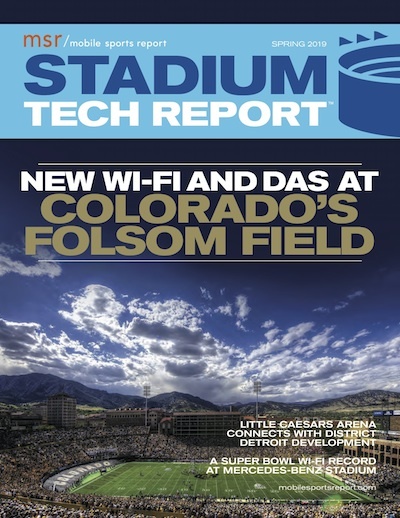 This issue has an in-depth look at the wireless networks at U.S. Bank Stadium in Minneapolis, as well as profiles of network deployments at the Las Vegas Convention Center and Orlando City Stadium! DOWNLOAD YOUR FREE COPY today! Built nearby the Detroit Lions’ Ford Field and the Tigers’ Comerica Park, the new hoops/hockey stadium seats 19,515 for hockey and 20,491 for basketball. 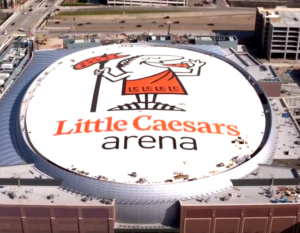 Unlike many stadiums of the past which rise up from the ground, Little Caesars Arena is built into the ground, 40 feet below street level. The innovations in construction and accessibility, including an outdoor arena adjacent to the indoor one, may require another full profile and an in-person visit. For now, we’ll concentrate on the wireless deployment in and around Little Caesars Arena, which was funded in part by a sponsorship from Comcast Business, which provides backbone bandwidth to the arena and the district in the form of two 100 Gbps connections. 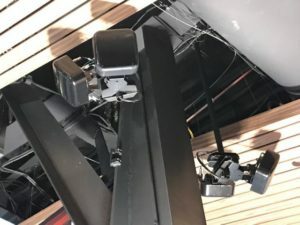 The Wi-Fi network design and deployment, done by AmpThink, uses Cisco Wi-Fi gear; Cisco’s Vision for Sports and Entertainment (formerly known as StadiumVision) is used to synchronize video output to the 1,500 TV screens located in and around the venue. On the cellular side, Verizon Wireless built a neutral-host DAS, which was getting ready to welcome AT&T as the second carrier on board shortly after the opening. According to King, the Wi-Fi network has approximately 1,100 total APs both inside and outside the arena, many of those from Cisco’s 3802 series, which each have two radios per AP. For many of the 300 APs located in the main seating bowl, Little Caesars Arena went with an under-seat deployment, with some others placed in handrail enclosures, especially for the basketball floor-seating areas. “AmpThink did a really nice job with the deployment,” said King, who said the arena’s open-air suite spaces helped provide “lots of flow” to wireless gear, without the historical overhangs around to block signals on different levels. One early visitor to the arena saw many Wi-Fi speed tests in the 50-60 Mbps range for both download and upload, as well as several in the 80-to-100 Mbps range, signs that a strong signal was available right at the start. 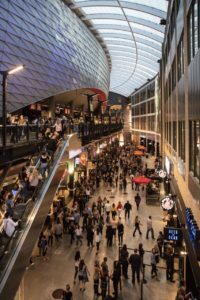 Like The Battery area surrounding the Atlanta Braves’ new SunTrust Park, the District Detroit is meant to be a stay-and-play kind of space, with restaurants, clubs, office spaces and residences seeking to lure visitors and residents to do more than just see a game. 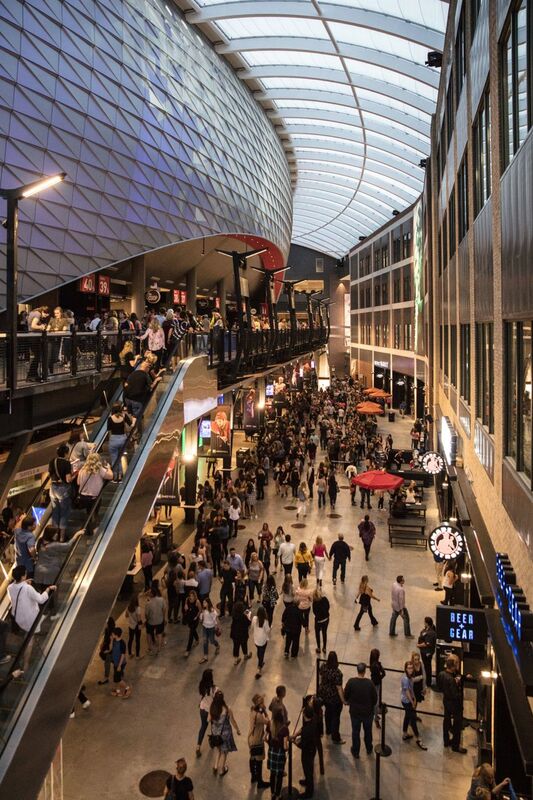 For King and his team, one of their tasks is to ensure that visitors can stay connected no matter where they are inside the district, including inside restaurants, offices and other indoor spaces. 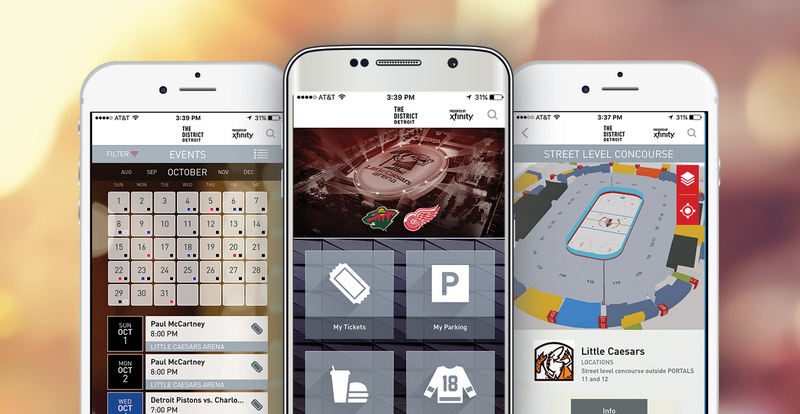 Back inside Little Caesars Arena, the team and stadium apps are built by Venuetize, which built a similar integrated app for the Buffalo Bills and the Buffalo Sabres, one that also extends outside arenas to support connectivity in city areas. King said that Little Caesars Arena will be testing pre-order and express pickup concession ordering through the app, with a focus on seating areas that don’t have ready access to some of the club facilities. Like any other new facility, Little Caesars Arena will no doubt go through some growing pains in its debut season, but for King and others who spent time getting the venue ready it’s fun to have the doors open. “It’s really great seeing it all come to life,” King said. 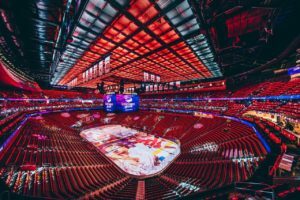 According to a press release from Comcast Business, the service provider will bring two 100-gig circuits of bandwidth to the arena, the new home of the NHL Detroit Red Wings and the NBA’s Detroit Pistons. 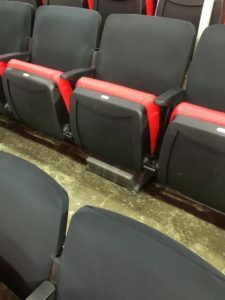 Set to open on Sept. 12, the new venue will have more than 1,000 Wi-Fi APs in the arena and in “surrounding buildings and event spaces,” according to the Comcast release. Comcast has a similar arrangement with the Atlanta Braves and their new home, SunTrust Park, as well as with the surrounding live/work environment there, called The Battery Atlanta. 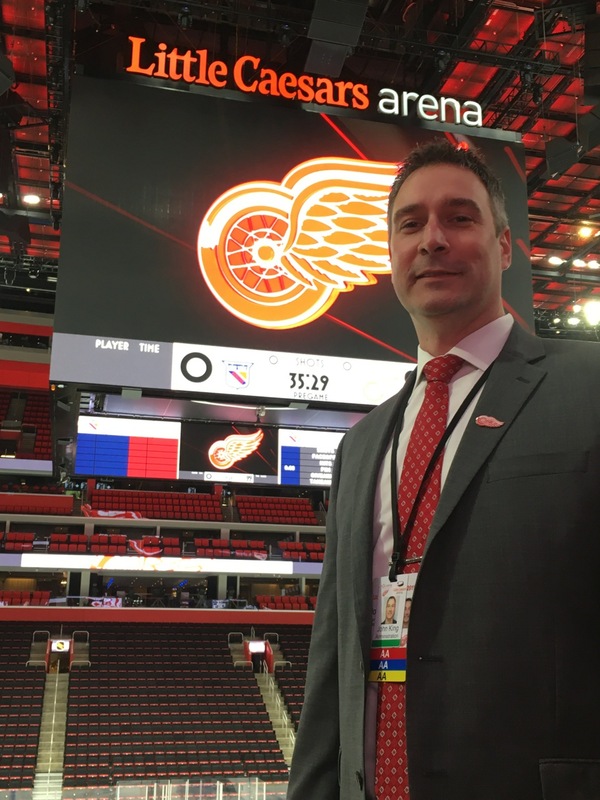 In a report in Crain’s Detroit Business, a Comcast exec said the Detroit deal was taking such sponsorships “A whole ‘nother step further,” adding that the District Detroit area is much bigger than the Battery’s footprint. The contract covering the operation of the Wi-Fi network at the Golden State Warriors’ Oracle Arena is up for auction, as part of the fallout from a lawsuit involving alleged fraudulent business practices by Wi-Fi deployment concern SignalShare. UPDATE, 7/7/16: According to the auctioneers, the auction is currently postponed, due to their claims of a bankruptcy filing by SignalShare. More details as we learn more. SignalShare, which has installed and operated Wi-Fi networks in a number of large sports venues, including arenas used by the Detroit Red Wings, the Houston Rockets, the Sacramento Kings, the University of Maryland and others, is being sued for $7.8 million by NFS Leasing, an equipment leasing company, over a dispute involving allegedly fraudulent leases by SignalShare and SignalShare’s default on an agreement to pay back money obtained through those leases. As part of the ongoing legal proceedings, NFS has apparently scheduled an auction of SignalShare assets it claims, including leases, software code and hardware, for July 14 through Paul E. Saperstein Co., Inc. So far, Mobile Sports Report has not been able to get any comments on the lawsuit or the auction from SignalShare, NFS, or any of the venues where SignalShare had installed networks. According to the auction site, NFS will make available for auction the contracts between SignalShare and the following list of teams and venues: The Golden State Warriors and Oracle Arena; the Carolina Hurricanes and PNC Arena; the Houston Rockets and Toyota Center Arena; the Detroit Red Wings and Joe Louis Arena; the Jacksonville Jaguars and Everbank Field; the Milwaukee Bucks and Brady Harris Arena; and the Las Vegas Sands Convention Center. According to sources familiar with some of the SignalShare deals, some of the networks were run under a lease agreement, where the team or venue owners paid SignalShare a monthly fee for operation of the Wi-Fi network, with SignalShare retaining ownership of the actual equipment. According to legal documents filed in the case, NFS provided the financing for many of the existing SignalShare deals, as well as millions more in financing for deals NFS claims never actually existed. So far, there has been no public accounting for where the millions provided by NFS for the allegedly fraudulent leases ended up. 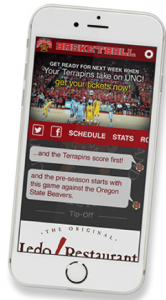 While the leases are potentially interesting to many possible parties — firms who could take over the network operations, or who might be interested in purchasing the leased equipment — the asset with perhaps the most tangible worth is SignalShare’s “Live-Fi” software, a kind of customer portal program meant to help teams and venues engage more closely with fans and to also facilitate advertising sales. According to legal documents filed in the case, SignalShare owners apparently attempted to transfer the ownership of the Live-Fi code to a subsidiary firm to apparently keep it out of any claim proceedings, a move that was recently blocked when the courts granted an injunction requested by NFS. Aside from whatever happens in the ongoing legal case and at the auction, for the venues involved the bigger question is more likely what happens to their existing or planned networks. In several of the mentioned deals, including the Jaguars, the University of Maryland and the Detroit Red Wings, SignalShare publicly partnered with Wi-Fi gear provider Extreme Networks; Extreme representatives declined to comment on any specifics of the SignalShare lawsuit. One common trait shared by several of the SignalShare deals was that they involved Wi-Fi networks at arenas that were scheduled to be replaced or abandoned by the teams in the near future — the Warriors, Kings and Red Wings are all already building or planning to build new stadiums. The SignalShare “leasing” model may have seemed more attractive than spending the potentially millions in upfront costs for a network that may only have been used for a few years. The only thing for sure now is that the future of Wi-Fi at the venues mentioned seems to be on hold until the legal questions around SignalShare’s operations are answered.